Treat yourself to an unforgettable holiday in this 5 star campsite in Languedoc-Roussillonlocated in the heart of magnificent surroundings: the Domaine d'Arnauteille campsite. The campsite is located 14 km from the Canal du Midi, 18 km from the city of Carcassonne and 10 km from the Abbaye de Saint-Hilaire. The serenity of the place allows you to spend some quiet time and helps you to recharge your batteries. Here at the Domaine d'Arnauteille campsite, you can choose whether you want to relax or get involved in leisure activities. The campsite offers you a large range of activities suitable for both children and adults. 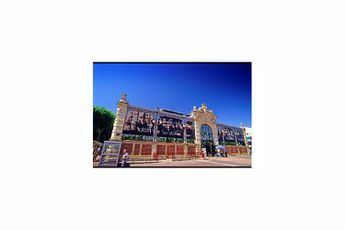 The swimming pool and its pool area includes a 3,000 square metre solarium where the whole family can get together to swim and relax. Children can also have fun in complete safety in the play area, take part in activities offered by the kids' club, or go horse- or pony-riding along the many signposted trails. Adults can expend some energy on the sports field, go trekking, horse-riding or cycling, or just rest in the shade of the green oaks to their hearts content. Other activities are also available near the campsite: fishing, Accrobranche and white-water sports. 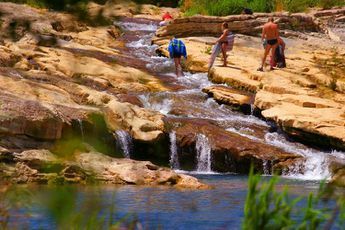 Nature lovers can also go hiking and discover the beauty of the region, its numerous natural sites and magnificent scenery. History lovers can visit the Cathar castles and the many abbeys situated near the campsite. To ensure that you don't miss out on any home comforts during your time at the Domaine d'Arnauteille campsite, you have: a restaurant, a bar, a snack bar, a grocery store, a laundrette and access to the internet. Nearest town Pomas (4 km). 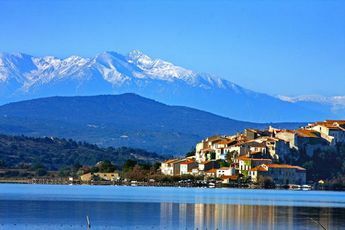 Head off in the footsteps of the Cathars and discover the wonders of the Aude! The Domaine d'Arnauteille campsite welcomes you to Montclar, in the heart of the wooded Malepère Massif. You will be easily charmed by the fabulous landscape of this magnificent hillside village. 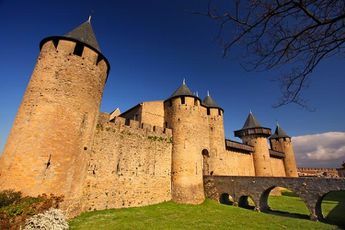 The heart of the Aude offers you the unmissable opportunity to discover Carcassonne, the biggest medieval city in Europe, with its 13th century chateau and its imaginarium. 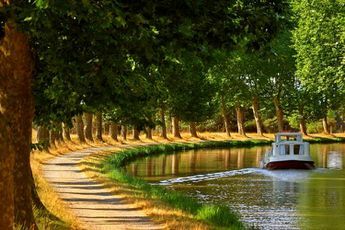 A little further away, you can fall under the spell of the beauty of the Canal du Midi, one of the jewels of the Languedoc Roussillon region.